"Take your cookies elsewhere." That's what the note said in neat, block-like print, attached to a box of Girl Scout Cookies. Someone is out to sabotage the new sweet shop in the neighborhood, and Maggie Brooklyn is on the case. If only she weren't so freaked out herself lately. Maggie's new dogsitting gig has her and her twin brother Finn hanging out in what they fear may be a real haunted mansion. And it's hard to solve real life mysteries when you think you're seeing ghosts! When a movie starring tween heartthrob Seth Ryan starts filming in Park Slope, everyone gets movie mania-including Maggie Brooklyn Sinclair. Though her plans to become a movie extra don't quite work out, Maggie manages to capture Seth's attention and he seeks her out at the Pizza Den to talk. 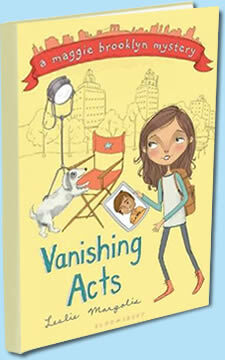 But just when Maggie's life is feeling like a romantic comedy, Seth disappears! 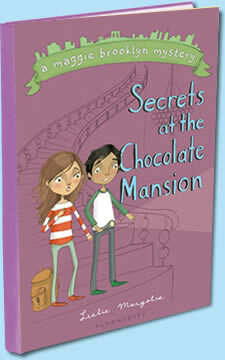 Everyone thinks he's been kidnapped, but Maggie knows better. . . . This young Nancy Drew is back, along with her twin brother and dog-walking business, in a second mystery that shines a spotlight on her super-sleuth skills. Leslie Margolis's pitch-perfect tween voice will leave fans begging for more of this loveable heroine. Dogs are disappearing in her neighborhood, and Maggie Brooklyn Sinclair knows all about it. After all, she has a semi-secret after-school gig as a professional (ok, amateur) dog-walker. Maggie hates to see a pup in trouble, so she's even willing to help her ex-best friend Ivy recover her rescue-dog, Kermit. Kermit's being held for ransom, and Maggie has noticed some suspicious behavior lately. But she never suspected her crush Milo could be involved . 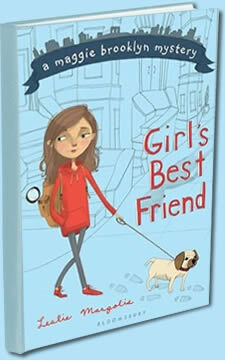 . .
Leslie Margolis's pitch-perfect voice and rich characters have endeared her to tweens, and her fans will flock to this hip new series featuring a clever and lovable new heroine, Maggie Brooklyn.